Overview: Miri and Kachin are two groups of related Tibeto-Burman peoples. 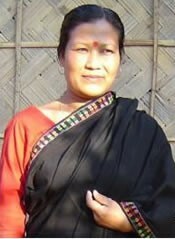 The Miri are a people of northern India inhabiting portions of Assam, and Arunachal Pradesh states. Kachin is the northernmost state of Myanmar, sharing a border with Arunachal Pradesh. Though ethnically and linguistically related, the Miri-Kachin people cluster is a religiously diverse group with Buddhism, Christianity, Hinduism, and ethnic religions all in practice among the various people groups.